A conservatory can add serious value to your property but heating it is far from easy. The glass structure often does little to keep a comfortable temperature in the colder seasons, even when made from energy efficient materials. That’s why it is essential to invest in the best conservatory heaters. But what should you look for? And what heating technology must you consider? There are a huge range on the market. From electric to propane models, some with ceramic or infrared elements, and more. To help you make your choice, we’ve tested and rated some of the best conservatory heaters in the UK. Take a look at some of our top picks below. Our #1 pick – a state-of-the-art designer wall heater that’s 100% energy efficient. 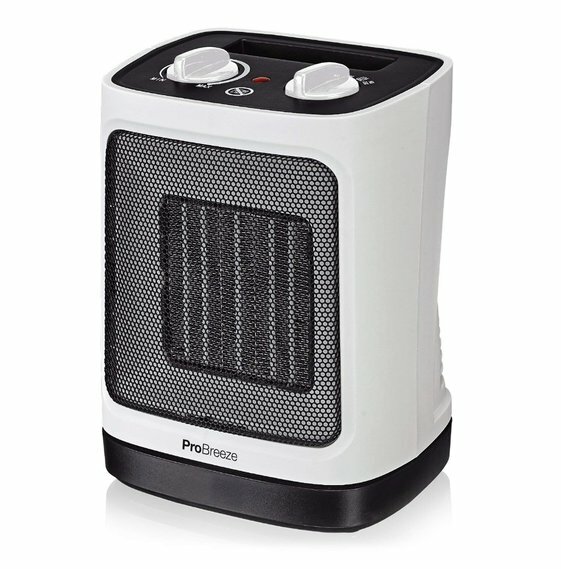 Lightweight and portable mini heater outputs ultra-warm heat and is ideal for small spaces. Multiple mounting options and Ice White design make this unit suitable for a wide range of interiors. Sleek, modern look and multiple heat settings make this product ideal for all areas. An integrated precision thermostat and fully programmable settings guarantee energy efficiency and reliability. Two operating modes and a flawless design bring heating efficiency and a real wow factor to your home. Wärme Designer is our favourite conservatory heater. It impressed us with a sleek design that blends in all interior styles and an outstanding energy efficiency that promises a minimal impact on your monthly electricity bill. Recommended by a popular UK interior design magazine, this wall heater mounts easily in any space as long as there is a wall socket within reach and a 30-centimetre clearance on the top and bottom of the unit. The waterproof casing makes it ideal for a conservatory but also for other high-condensation environments like bathrooms and kitchens. 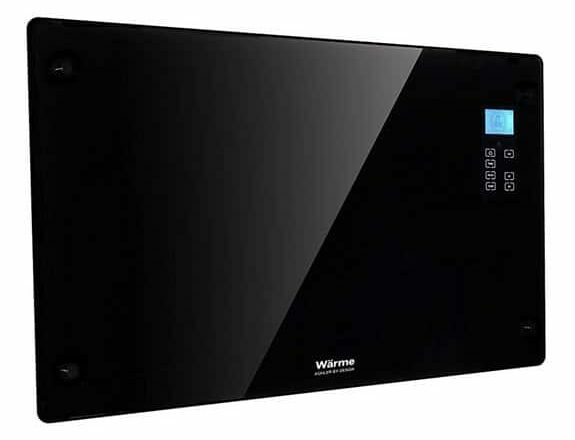 A built-in sensor protects the unit from overheating while the 2KW operating output easily warms up to 22 square metres. Ideal for households with children and pets, the Wärme Designer wall heater is easy to control from the integrated digital thermostat and makes for a perfect design element in a conservatory. Two operating modes allow switching from an instant heat mode to a programmed weekly cycle. Wall mounting bracket and kit included in the package. Compact dimensions make it easy to fit the heater anywhere, even in tighter spaces. The unit measures 47 x 8 x 82 (HxDxW) centimetres. Broad temperature range from 15 to 35°C and the unit allows for quick adjustments to meet your ideal comfort levels. No maintenance or servicing required. Hard to programme due to lack of comprehensive instructions. Programmed settings are lost if the unit is unplugged. Two heat settings and an adjustable thermostat ensure optimal heating. Pro Breeze Mini is a ceramic unit ideal for a small conservatory and for the homeowner shopping on a budget. 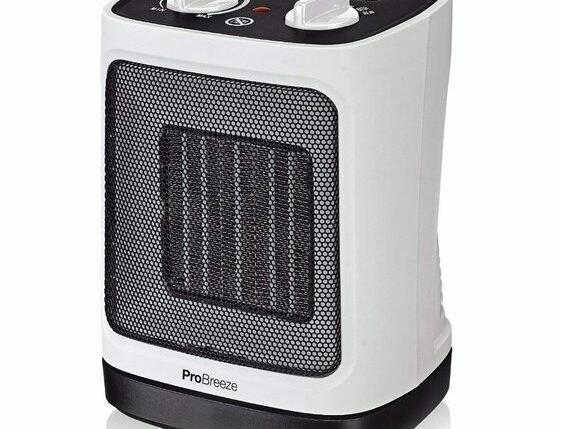 Compact and inexpensive, Pro Breeze is highly efficient thanks to its last-generation ceramic elements developed to radiate heat faster than traditional fan systems. Four operating modes and two heat settings ensure versatility, allowing the user to set their desired temperature levels and operating mode, which can be either static or oscillating. When engaged, the automatic oscillation mode rotates the fan 60°, ensuring an even distribution of the heat and effective warming in awkwardly shaped spaces and larger rooms – although performance is best in smaller environments. Another nice feature is the adjustable thermostat that monitors and controls the temperature to ensure optimal heating. Lightweight and easy to carry from one place to another, this ceramic fan heater is ideal for your home, office or conservatory. Ceramic heating discs ensure a faster and more efficient heat transfer and distribution in small spaces. 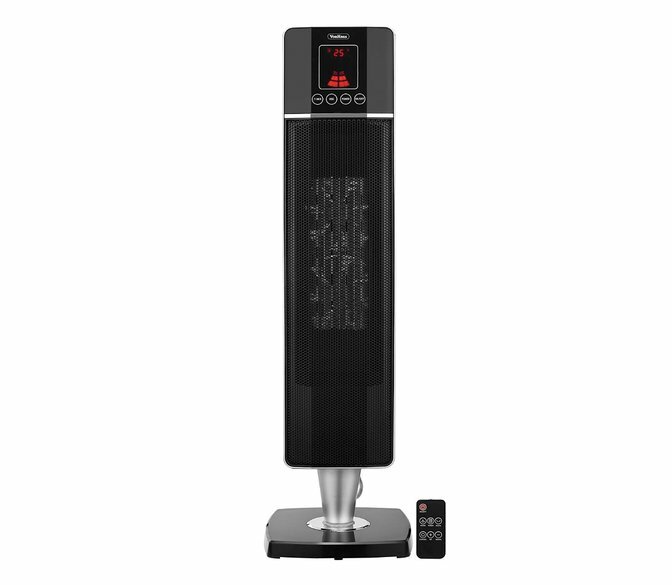 Two heat settings provide either 1,200 or 2,000 watts of output power. Built-in carry handle makes it easy to transport the heater from one room to another. Overheating and tip-over protection systems switch off the unit in unsafe conditions. Noisy apparatus could become annoying. Fast heating aluminium element warms up large spaces in no time. Perfect for a conservatory but also for an office or a room in your home, this unique panel delivers efficiency. Its unique aluminium heating element is designed to heat up fast and cool down slowly, ensuring a quick warming of any mid-size or large areas. Two mounting options give you the option to place it on the floor if space allows it, or even mount it on the wall provided there is sufficient clearance between the unit and the surrounding elements, ceiling included. Regardless of your choice, the slim profile and Ice White colour blend perfectly in most interiors. Like most products on the market, Homefront Prem I Air comes with an adjustable thermostat, but what makes the difference is the additional 24-hour timer that transforms the panel into a versatile heater. A simple on/off switch also allows you to turn off the unit as required and save on your electricity bill. Overheat safety cut-out delivers peace of mind, switching off the device in unsafe conditions. Wall mounting brackets and floor feet included for a quick and hassle-free installation. Comes with a 2-year manufacturer’s warranty. Energy efficiency could be improved. Room temperature is not displayed. Advanced ceramic material and copper heating element ensure energy efficiency and longer lifespan. VonHaus Oscillating Tower Fan Heater is a reliable and energy efficient unit designed to blend with most interiors. The sleek, black casing and the compact, portable construction add a real wow factor and practicality. Built for performance, the unit makes use of up to 2,000 watts of power and comprises of advanced ceramic and copper elements, which provide an effective heat transfer. Heat distribution is ensured by the oscillatory movement of the fan at an angle of 70°. We also liked the two heat settings that make the unit perfect for small and large areas, and the 8-hour timer that increases the product’s energy efficiency. An intuitive digital control panel makes it easy to adjust the settings to your needs, which are clearly visible on the large LCD screen. Freestanding tower integrates with success in most interior aesthetics, adding a touch of style to your conservatory. Overheat and tip over switch guarantees safety. 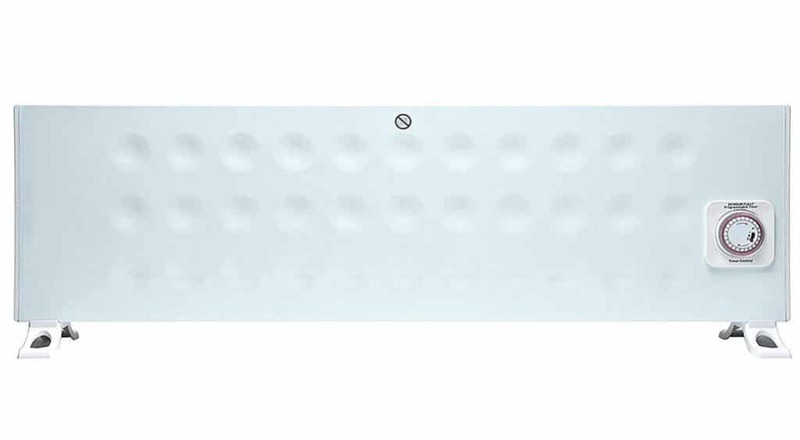 Low noise level of 55dB makes the heater perfect to use in bedrooms or living areas. Two temperature settings allow a swift control of any energy consumption. Temperature varies from 10 to 35°C. Backed by a 2-year manufacturer’s warranty. Easy to operate either from the intuitive control panel or via a remote control. The air is blown out through a section in the middle of the column and doesn’t provide heat at floor level. Perfect for conservatories, bathrooms and other high condensation areas. 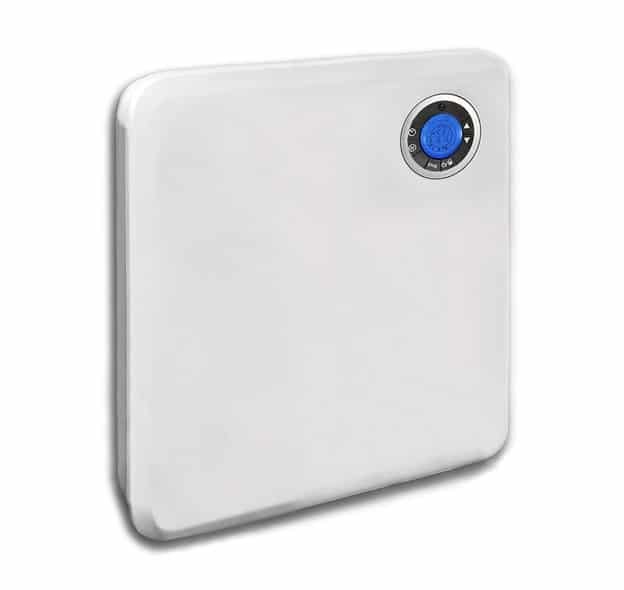 Futura Electric Panel is an innovative product designed to withstand high condensation areas. Its IP24 digital electric radiator is water and dust resistant while the robust construction comes with wall mounting brackets and floor feet for versatile installation. Fully programmable, the product comes with a 24/7 digital timer that allows you to set up a weekly heating schedule and a temperature set range from -5°C to 50°C. The integrated precision thermostat helps reduce running costs, switching the unit on and off as needed. Another attractive feature is the sleek design and quiet operation. Homeowners can also choose their desired power output from the four options available. A 400 watts heater is perfect for areas up to 6 square metres, but more powerful units up to 2,000 watts can address the needs of most other sized areas. Three heat modes also allow for efficient energy management and ideal heating of your space. The product is backed up by a 2-year manufacturer’s warranty. Comfort, economy, and frost-free heat modes ensure suitability for a wide range of applications in your home, conservatory, or garage. Sturdy feet with wheels make it easy to move the heater from one room to another. Simple plugin and installation require minimal DIY skills. Child lock function prevents tiny hands from changing the heater’s settings. Auto open window detection feature detects sudden drops in room temperature and switches off to save power. Thin metal construction is easy to damage. Programming the heater is complicated. Luckily, the unit comes with plenty of pre-programmed options. Heating up your home during the long British winter has a significant impact on your energy bill, accounting for up to 70% of your consumption. Cutting down this figure not only saves you some money but also reduces your carbon footprint on the environment. Luckily, there are various ways to heat your home while saving on energy. Here are our expert’s tips on keeping yourself warm and the bills low this winter. Whether you’re using a boiler or a space heater, investing in a good (or in a unit with a good) thermostat is key to achieving energy efficiency. This device is designed to turn off the heat when a pre-set temperature is reached, saving on energy. Likewise, the thermostat turns the heat on when the room temperature drops below a pre-established threshold, keeping your home warm. While a thermostat is essential, a timer can help you achieve even greater efficiency. This device is designed to turn the heat on at a certain hour, according to a pre-programmed schedule. You will be able to turn off the heat before going to work while the timer will turn it on to heat up the house just in time before you get home. Windows disperse heat faster than walls, so maximising heat retention in this area is a must. Thermal curtains provide an effective barrier between your cosy home environment and the cold exterior, provided you keep them closed during the night. During the day, take advantage of the sunlight and keep the curtains open to allow the warmth of the sun to enter. Extractor fans prevent condensation problems in poorly ventilated areas, but they also waste your heat. During winter, try to keep them on as little as possible, preferably no more than a couple of hours each day. Only a few people know that some of the heat radiated by your system is lost through walls and floors. But there are ways to reduce heat dissipation. To prevent the loss of heat through walls, wrap a piece of cardboard in aluminium foil and place it behind the radiator. This will help reflect the heat into your room instead of wasting it through the wall.If you have hard floors, cover them with carpets or rugs. These decorative elements also trap heat, keeping your environment warmer. Homeowners tend to focus on the heater or radiator’s performance alone and usually lose heat from other sources. But you should take advantage of any heat source to keep your home warm and energy bill low. Two heat sources often overlooked are your oven and your bathtub. The former does an excellent job of heating your kitchen if you leave its door open after you’ve baked any food. The latter holds hot water which can heat up your bathroom after you’ve cared for your body. In fact, don’t hurry to drain the tub as soon as you’re done with your bath. Wait instead for the water to cool down before draining it. Ceiling fans are often used during summer to keep the room cool but what most homeowners don’t know is that most ceiling fans are designed to enhance the temperature during winter too. Our expert advised ceiling fans, which usually rotate counter-clockwise to remove heat from the room, also have a winter setting that spins them clockwise. This movement pushes the air down. Since heat rises, the fan helps it get back where it is needed. Just pay attention and make sure you set the fan on the lowest speed setting. If you live in a big house, installing space heaters in the rooms you use the most could be more effective than heating your entire home through a centralised system. There are dozens of models to consider although the most efficient have either ceramic elements or heat the air via infrared technology. Some designer models even integrate with success in any interior, adding a touch of style and elegance to your room. To increase energy efficiency and the level of comfort when using a heating unit, keep the door closed to prevent heat from escaping the area. Contrary to popular belief, keeping your couch close to the radiator or heater won’t keep you warmer. Large furniture does nothing but block heat, trapping it in the thick material. Instead, by moving your sofa away from the heat source, you’ll promote heat dissipation in the room, and your environment will warm up faster. An exception to this rule is placing a table or shelf over the heating unit. The furniture traps the heat under its surface but doesn’t block it; instead, it slowly releases it into the room keeping your space warm for longer. Just make sure the table or shelf doesn’t touch the radiator’s surface and that the system is properly ventilated. Studies suggest that it’s not your house that needs heating up, it’s you who needs a comfortable living temperature. As such, you can cut down your energy bills and still live comfortably if you keep yourself warm with clothes and hot beverages. Put on a jumper instead of a tee and drink hot tea or coffee as often as possible. This will allow you to set your thermostat up to two degrees lower than usual. Although it may seem little, this change can help you increase energy efficiency.